It's time for a new Animation Personal Trainer session. This next APT will start the week of October 12th and run through November 13th. 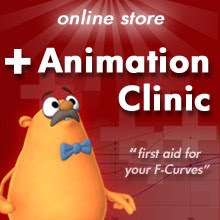 I am accepting student registration now on my Animation Clinic online store. As always spaces are limited and students are taken first come-first served. Registration will close on Friday October 2nd. Important Note: This will be the last APT for quite a while. At this time I don't plan on having any APT sessions before the summer of 2010 due to my work schedule. So if you've been wanting to get in on an APT session, then this next class starting in October will be your last chance for perhaps a year. I have a dandy FAQ if you are filled with questions about the APT. If after reading the FAQ you still have questions regarding the APT, then you can always feel free to email me.